Welcome to golf heaven. Blessed with breathtaking scenery, unforgettable signature holes and championship caliber course design, it's no wonder why Hawaii attracts so many golfers from around the world. Discover a variety of unique course layouts on Hawaii's six, geographically distinct islands—from greens lined with volcanic rough to stunning seaside water hazards. And with more than 70 amazing golf courses to choose from, it won't be difficult to find the perfect course for you. 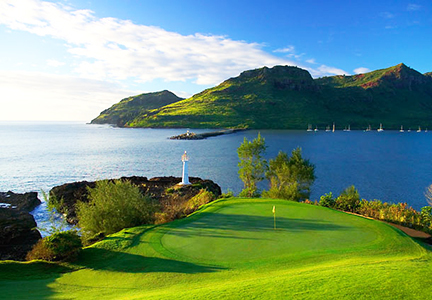 Oahu is home to over 40 golf courses—including five private clubs and nine military courses. In fact, there are 29 courses easily accessible to visitors at 25 different venues. These range from the very first golf course built in the islands (in 1898)—the Moanalua Golf Club’s nine-hole hill-and-dale affair, which operates on a semi-private basis—to golf resorts that plays host to the PGA. Oahu also presents a wonderful array of independently operated daily fee tracks that range from par-3 courses to two of the world’s most challenging layouts. The Magic Isle is known for its beauty—and so are its golf courses. Maui has two distinct areas where the bulk of the accommodations and golf resorts are situated. West Maui, which features the bustling old whaling village of Lahaina, delivers 36 holes at both the Kaanapali Beach Resort and the Kapalua Resort. South Maui, which lies in the wake of Haleakala, is home to two resorts, Wailea (54 holes) and Makena (36 holes). Four other Maui courses are located between in Wailuku and Pukalani. Kauai offers nine courses at seven golf venues ranging from Kukuiolono’s charming 9-hole layout with spectacular views of Niihau to resort courses that have once hosted LPGA events and the PGA of America’s Grand Slam of Golf. Three major resorts dominate the Kauai golfscape: Princeville on the spectacular North Shore, which offers 45 holes at two locations (Prince & Makai), Kauai Lagoons’ 36 holes (Kiele & Mokihana) nestled near the Lihue airport, and the 18-hole Poipu Bay Golf Course along Kauai’s southern coastline. Independent daily fee courses are found in Poipu at Kiahuna Golf Course and in Lihue at the Puakea Golf Course. Lanai features The Experience at Koele, an 18-hole championship course designed by legends Greg Norman and Ted Robinson. The signature 17th hole magnificently drops into a valley more than 200 feet below the tee-box. Along the southern coast, Jack Nicklaus created one of his most famous masterpieces, The Challenge at Manele. Set along sea cliffs, this target-style course offers unsurpassed views of the Pacific Ocean. Both courses consistently rank among the best in the world by travel publications and guides. Not the island for any serious golfer. The golf on laid-back Molokai is as unassuming as you might expect it to be. At the lovely Ironwood Hills Golf Course, a nine-hole public track built in 1928, it’s okay to just show up for a tee time. There are no golf pros. Not even a clubhouse. Just 3,088 yards of upcountry pasture with splendid views. The above information was provided by the Hawaiian Visitors Bureau.